You look at all of what’s going wrong with the world. You try to get someone else to see what you see, to have the same need to act on the ails of the world, but they just want to know what is going on with Kylie Jenner. Is she having a boy or girl? What does Kim think about this?! It’s frustrating. You wonder what in Hell is wrong with this person. Can’t they see what’s wrong? Why are they more interested in keeping up with what’s going on with the Kardashians than climate change? Well… that person is an ape. We all are. And as apes we are a social animal. 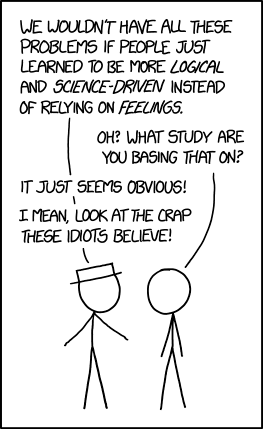 XKCD – a great webcomic. I speak this as me. From my own experiences. I would go to a site to find out what is going on with Taylor Swift faster than I would run to Nature, or Time, or [insert prominent, important news source here]. Who cares about North Korea? I want to know who Taylor is dating. I mean… do I have a chance? (According to my wife: no.) And have you seen the latest pictures from Lea Michelle? Sure! It’s a problem. But it isn’t a problem. It just is. And I am not just saying this because I am one of those people. I look around every day and see all that is going wrong with the world. I would get angry that we don’t pay attention to it, looking at the big, important issues, but I have to remember that in most cases, these issues are just too damn big for our ape brains. We have our own issues to deal with. And plenty of them. Our worlds are so small that it is often difficult to find the means to make a difference in the bigger world. And the changes that we would often have to make in our own lives are so overwhelming that it is a wonder we make any changes at all. Just remember, even though we have the ability to be human, to work beyond our biological influences, we are still just apes. Animals. And not all of us have the ability to fight against that all the time. Sometime’s it is just easier for our brains to just gossip. We’re not beyond hope. But can that hope wait until I find out what’s going on in Hollywood this week?